When adjusted for inflation, the state of Iowa has only increased total state funding per student by 0.04% from 2008-2014. When adjusted for inflation, the current state formula funding per student is 6.2% lower in the current school year (2015-2016, FY2016) than prior to the recession (2007-2008, FY2008). Those are pretty serious issues. The Center on Budget and Policy Priorities (CBPP) was founded in 1981 to analyze federal budget priorities, with a particular focus on how budget choices affect low-income Americans. We have broadened our work considerably over the years as we responded to new developments and entered new areas of research. Most notably, we began extensive work on budget priorities and low-income programs at the state level in the 1990s as Washington was shifting responsibility over many areas of low-income policy to the states. In the states, we also collaborate with non-profits — including the more than 40 members of the State Priorities Partnership — to build their capacity to conduct sound budget and policy analysis and participate effectively in policy debates. There are two figures from their report on which I would like to focus. The first figure, compares total state funding per student, adjusted for inflation, from fiscal year 2008-2014. Fiscal years begin on July 1 of the previous year and end on June 30 of the year noted. For example, FY2008 is July 1, 2007 - June 30, 2008. So from FY2008-2014, the state of Iowa has increased the total amount of money spent per pupil by only 0.04% when adjusted for inflation. Not exactly "throwing money at schools," are we, Governor Branstad? The state requires a levy of $5.40 per $1,000 of assessed land value. This provides the foundation for general fund spending on K-12 education. The state is responsible for providing 87.5% of the state cost per pupil (SCPP). The SCPP is set by a rate of change in state supplemental aid (SSA, formerly allowably growth) set each year by the Iowa legislature. Local governments can choose to levy additional property taxes to raise the remaining 12.5% of SCPP. According to the CBPP, this dollar amount for the state of Iowa, when adjusted for inflation, is 6.2% less in the current school year (2015-2016, FY2016) than it was prior to the recession (2007-2008 school year, FY2008). Throwing money at schools won't improve them. - Branstad, paraphrased in a July 13 article from the Des Moines Register. "In the past 20 years, state aid to school districts has increased from $1.3 billion to $2.7 billion." "The portion of the state’s general aid fund for public schools has gone up from 37.8 percent to 41.9 percent." 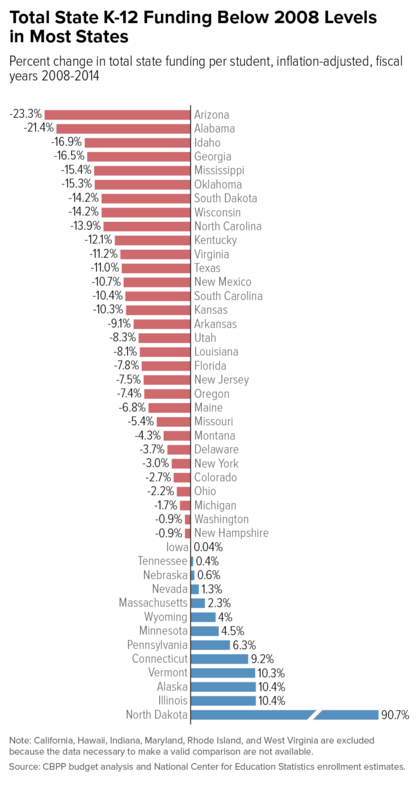 "Per pupil, state public school costs have increased from $3,406 to $6,446." The average teacher salary has risen from $30,700, 32nd in the nation, to $50,730, 25th in the nation." "During the same period, academic achievement in Iowa has dropped in comparison to other states." But to me, these facts just don't add up. Teachers have repeatedly said that what we are getting is not enough. This report shows that when adjusting for inflation, we haven't been providing our schools with adequte funding. Let me be clear: if the cost of K-16 education in the state of Iowa is "too high," then let's have that conversation. Unfortunately, the conversation we are having is one of falsehood and political spin. We simply have not adequately funded education in Iowa. How are we going to move forward?